Today’s multi-tasking moms are busier than ever! Expectations are high and time is short when it came to kids’ parties and family celebrations and after comparing herself one too many times to the moms who made everything from scratch and feeling like she was letting her kids down, Deborah Stumm came up with a simple solutionmaking easy but adorable treats that are partially homemade. 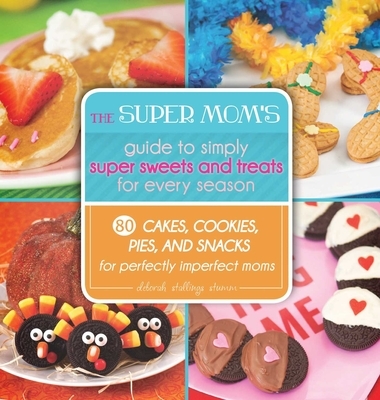 Most of the treats in The Super Mom’s Guide to Simply Super Sweets for Every Season don’t even involve baking and take no time at all. The book features festive family-friendly recipes that take twenty minutes instead of two hours. Recipes include Oh-So-Easy Santas, Sweetie Pie Pops, Caterpillar Kabobs, Summer Dipped Strawberries, and Sweet & Salty Spiders over eighty simply, super snacks and sweets. Using everyday ingredients, even kitchen novices will be able to make these creative and corner-cutting treats to celebrate the milestones of winter, spring, summer, and fall. The treats showcased in the book are perfect for home, kids’ parties, entertaining or anytime mom needs to perform in a pinch! Deborah Stallings Stumm: Deborah Stallings Stumm is the founder of Party Plan-It, Inc., the parent company of Super Moms 360, Event Connection 360, and Wedding Concierge 360. As an entrepreneur, author, mom of two, and wife, she is passionate about finding ways to make women’s lives easier. Prior to starting her own business, Deborah traveled the world as the vice president of sales for a consumer products company and her diverse career history includes expertise in marketing, advertising, sales, and event planning.